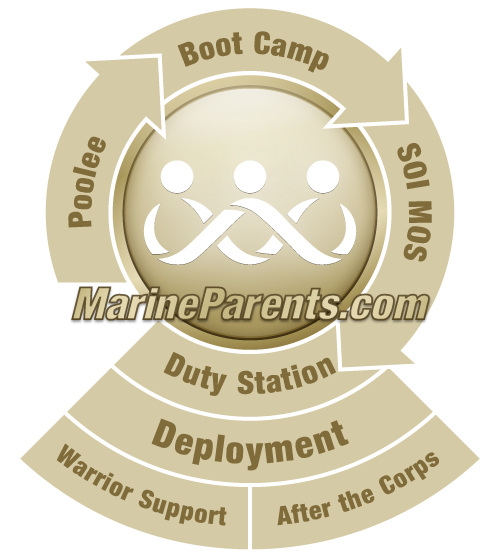 Making your travel plans to San Diego or Parris Island is easy enough, but what about your soon-to-be Marine? Will he/she travel back home with you for 10-day leave? How do you know what time to arrange flights? If you didn't discuss this with your recruit prior to leaving for boot camp, and most of us did not, and the letters you're getting from your recruit aren't giving you the answers you need, where do you turn? When should you buy your ticket? Will your recruit graduate on time? The projected graduation date is NOT set in stone for each recruit. Most recruits graduate with the company and platoon after 13 weeks of training. However, if your recruit becomes ill or injured, the graduation could be delayed. The generally accepted recommendation is to purchase your airline tickets in the 10th week of boot camp if it appears that your recruit is maintaining health, well-being, and on track with the rest of his/her platoon. We have many parents with a lot of experience in making these arrangements. The information below is based on that experience. As you read through this, remember that each family and recruit may have different circumstances that will dictate different needs, but this will help you get a bit more information and feel a little more secure in making the travel plans. Your soon-to-be Marine is your best source for information. Communicate with him/her via letter writing about travel plans. Upon leaving the Depot, your new Marine will have a copy of his/her orders for travel. These orders MUST be adhered to emphatically. There is no room for late flights, missed connections, or late arrival to the School of Infantry (SOI). If your recruit is taking 10-day leave after boot camp, any travel costs during that time are his/her responsibility. Make sure your Marine takes advantage of the USO facilities at the airport when s/he checks in or is waiting to fly out. Many families want to travel with their new Marine when leaving the Depot after graduation. To assure you are traveling on the same flights, you'll have to coordinate with one another on dates, times, and airlines. Recruits are given an opportunity to make their own travel arrangements on the Depot with SATO Travel. You may arrange for your Marine to travel home with you, but be sure to send your recruit a hard copy of the travel plans. This way they know what is going on. If you choose to make the travel plans for your recruit, communication with one another will be vital. Please see the information in the top right block titled "What's After Boot Camp" and make note of the time frames involved with 10-day leave, possible recruiter's Assistance, and when/where s/he will need to report to SOI. When planning return travel, make sure to provide enough lag time in between when they arrive and when they must report. You need to provide lag time in case of inclement weather or travel delays (especially during the winter months and around holidays). You never, ever want your Marine to report in late. Many airlines offer military pricing for flights. A valid military ID is required for check-in. Many folks assume that military pricing indicates a discount for our military personnel. However, most military rates are actually an insurance policy of sorts that allow for changes in travel if/when orders are changed. The costs for changing flights may be lower or change fees may not apply. Use caution when purchasing your airline tickets and make sure you understand the rules for each flight you book. There are some airlines that offer no-penalty for changes for all passengers. Different airlines have different prices and policies when it comes to the number of bags your Marine is able to check for free. If your Marine is flying home, contact the airline ahead of time to see what their policy and prices are. Marines from Lima Company, 3rd recruit Training Battalion, await the dismissal command from their senior drill instructor prior to beginning liberty call at Marine Corps recruit Depot San Diego, January 29, 2015.